If we have not answered YOUR question, please email Contact Us. Why Are Dark-Leafy Green Vegetables Good For You? Dark-leafy greens nourish your body with essential vitamins, minerals, and phytochemicals to help prevent diseases like cancer and heart disease. Because of their high profile nutrition status, Canada’s Food Guide recommends that people eat a minimum ½ cup serving every day. Dark-leafy greens are among those that offer the greatest protection against heart disease. Some greens boast a more impressive nutritional profile than others — a good rule of thumb: the darker the greens, the greater the nutrition. Some of the more hard-working greens include Spinach, Collards, Kale, and Rapini. In addition to being full of vitamins, dark-leafy greens are naturally low in calories, salt, and fat, and are a good source of fibre. Why do the Cookin’ Greens recipes recommend adding Salt? Isn’t it better to eat less Salt? We need some sodium in our diets for normal health. Most Canadians get way too much, though most of that excess salt comes from processed foods (77 per cent) and not the salt added to home cooking (6 per cent). A package of Cookin’ Greens has NO added salt, so the little bit you add while cooking will not negatively affect overall health. Of course, if you prefer greens without added salt, simply leave it out. Why do the Cookin’ Greens recipes recommend adding Oil? Isn’t it better to eat less fat? Fat is an essential part of your diet. Canada’s Food Guide recommends including a small amount (about 2 to 3 tablespoons) of unsaturated fat each day, such as oil used for cooking. Plus, the fat from oil helps the body absorb the disease-fighting antioxidants in dark-leafy greens. Fats and oils also carry flavour, enhancing the taste of foods you eat. Aren’t Frozen Vegetables less healthy than Fresh Vegetables? 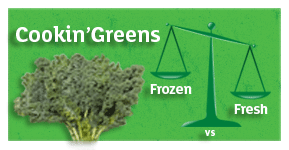 Many people are surprised to learn that fresh frozen vegetables are often healthier than fresh vegetables! This is because they are picked and quickly frozen, so their vitamin and mineral content stays intact. The vitamins in fresh vegetables degrade over time, so after they have been picked, packed, shipped, sold and cooked, their nutrient content can reduce significantly. Is it safe to give dark-leafy greens to babies (0-6 months)? A variety of vegetables are introduced into a baby’s diet between 6 and 9 months of age, and common choices include Squash, Peas, Green Beans and Sweet Potatoes. Leafy green vegetables are safe to introduce to your baby after 6 months of age. Historically, vegetables were introduced earlier — at 4 months of age — and some caution was given to dark green leafy vegetables since they contain natural compounds that babies had trouble digesting. Now that vegetables are not introduced until after 6 months of age, the caution around dark-leafy greens is no longer an issue. By 6 months, babies have developed the necessary stomach acids to properly digest leafy greens, though some parents prefer to wait until 9 or 12 months before they introduce soft-textured Spinach, Kale and Collards. What is the definition of Organics? According to the CFIA website, “Organic Products Regulations require mandatory certification to the revised National Organic Standard for agricultural products represented as organic in international and inter-provincial trade, or that bear the federal organic agricultural product legend (or federal logo).” For more information, please visit the CFIA website and read about organic products. 1) not to contain, or to ever have contained, an added vitamin, mineral nutrient, artificial flavouring agent or food additive. 2) not to have any constituent or fraction thereof removed or significantly changed, except the removal of water. For example: the removal of caffeine. 3) not to have been submitted to processes that have significantly altered their original physical, chemical or biological state (i.e. maximum processes). For more information, please visit the CFIA website and read about natural products. 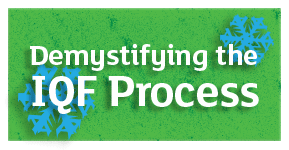 What is the definition of IQF? The Individually Quick Frozen (IQF) process, also known as flash-frozen, fresh-frozen, and quick frozen, is an innovative way to freeze foods over a conveyer belt that moves the product into a blast freezer, freezing the food very quickly, and then dropping it into packaging. Ecocert is a global certification body, established in France in 1991 by agronomists that wanted to standardized the regulation of foods by those committed to offering environmentally friendly forms of agriculture. 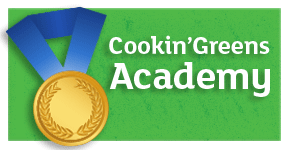 Ecocert works with Cookin’ Greens, to help us bring responsible organic flash-frozen vegetables to consumers. What vegetables are considered dark-leafy greens? How do I read a Cookin' Greens production code? Example: Designer’s Mix, packed at 5:30 pm on Feb 4, 2014. Code format: Best Before dating with Country of Origin Information BB/ MA – YYYY / MM / DD Ingredients from (or Product of). We provide a country of origin for each ingredient used by The Toby Brand. Followed by: Ecocert registration #, Packing Establishment #, Day, Month, and Year when packed. Example: Cookin’ Greens Organic Kale, Corn & Peas Blend packed on September 19, 2014.